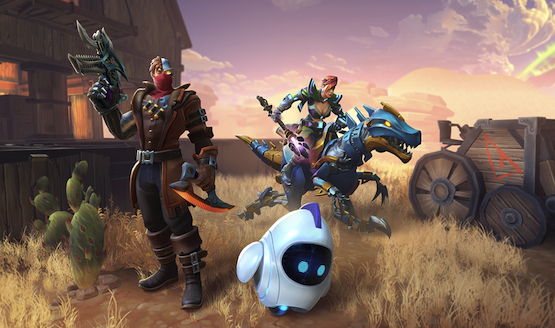 Realm Royale Battle Pass 3 has gone out of this world with new skins for all four classes, more chicken skins, animated sprays, alternate map markers, and new mounts. This Sci-Fi themed Battle Pass, costing 900 Crowns (around $8 of in-game currency) for the paid path, will grant rewards and a 50% XP increase for the whole season, in addition to all the new cosmetic items. You can also get the Battle Bundle, which instantly unlocks 20 levels and comes with the Radon Flux Mage Skin, Tier 2 of the Six-Shot Cyborg Skin, and the Mekkasaur mount. This comes at a price of 2300 crowns (around $24 of in-game currency). The outerspace theme continues with the chicken skins and mounts. There’s a Wall-E EVE-like robot skin called the R0B0K unlocked at Level 1 and a fully geared up chicken called BattleBok that is available at Level 25. The BattleBok also has tiers. You can tear through Realm Royale in a mechanized dinosaur called the Mekkasaur at Level 20 and a bike called the HL-1700 at Level 50. Realm Royale, is a battle royale, with similar third person shooting to another free-to-play title from Hi-Rez Studios, Paladins. The unique twists included in this game are the ability to craft items and once you are downed, you turn into a chicken, scuttling along and trying to avoid incoming fire. The two previous battle passes for Realm Royale had prehistoric and Pirates vs. Ninjas themes. Have you tried this free-to-play game or have you been playing Fortnite and/or Apex Legends? Let us know what you think of it!